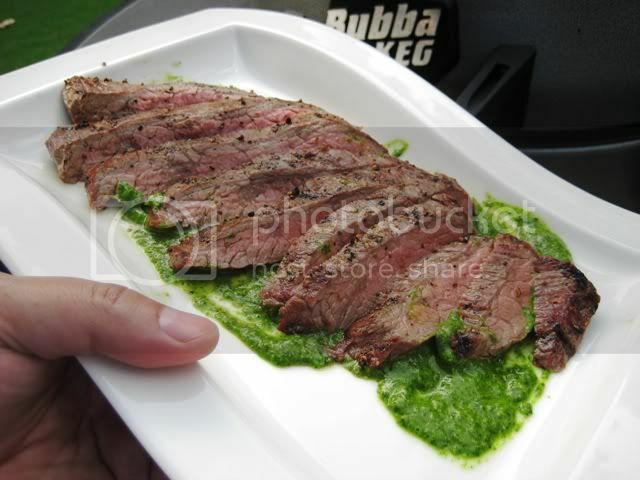 Made my first flank steak on the grill for dinner last night. My family ate in complete silence, which means they liked it! This meal came together quickly, mostly because I made the sauce while the grill was heating up. I made some asparagus while the meat was resting, so from start to finish I had food on the table in about 45 minutes (my wife pulled the steak out of the fridge before I got home and made some instant mashed potatoes while I was grilling). 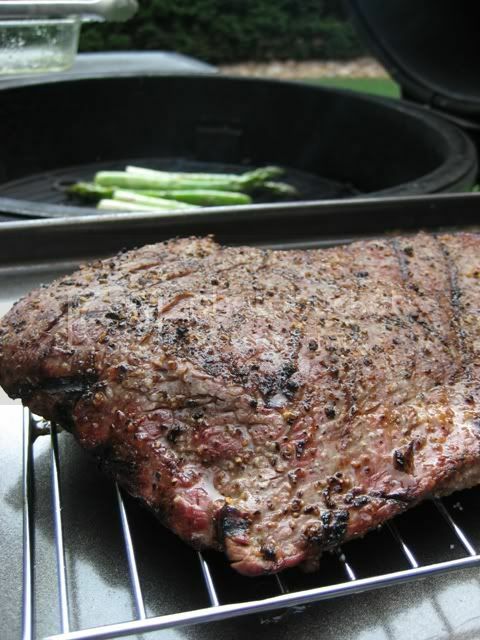 The flank steak was just seasoned with salt and pepper and cooked at 700* for about 4 minutes per side. 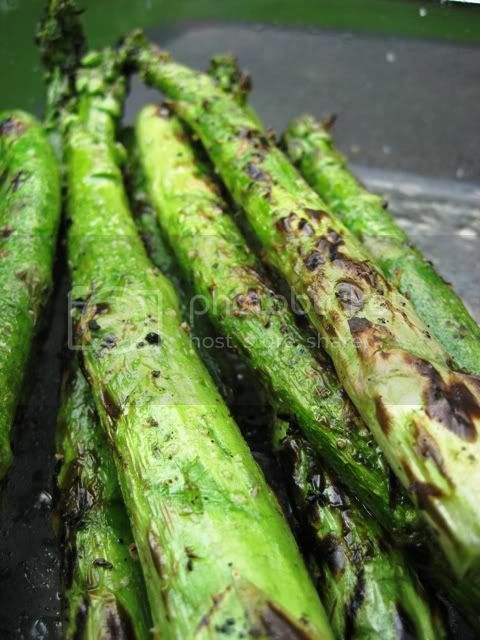 The asparagus was seasoned with EVOO, salt and pepper and cooked at 700* until I started to get some charring around the outside. BTW, those are awesome pics!!! I spent about $2 total for the sauce (parsley, cilantro, serrano, garlic), so it wasn't terribly expensive to make. It made about 1 1/2 cups of sauce, which is enough for 5 steaks! Fortunately it keeps pretty well and goes with everything. We even mixed it into our mashed potatoes. Looks Great Ricky, nice job on the steak! 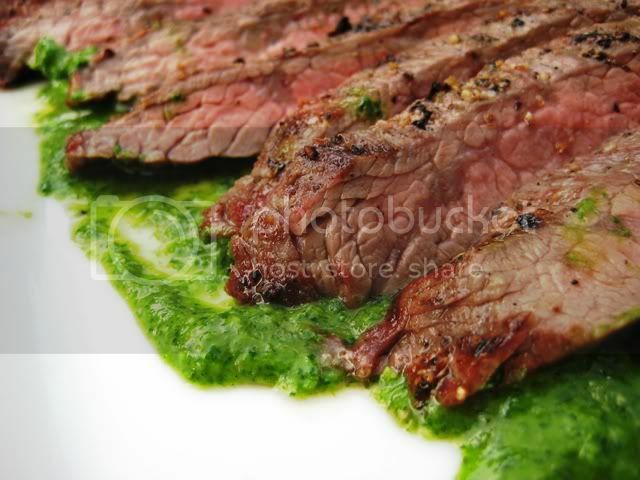 I love chimichurri. I don't blend mine, I meticulously pull all the leaves off leaving out as much stem as possible (to avoid it feeling like eating grass), then chop it all superfine by hand. Lots of work but well worth the effort. Mine has no cilantro in it (but I'm going to try that), fresh oregano leaves, white wine vinegar, bay leaves (remove after a day or two). I like to make it a day ahead if I can. 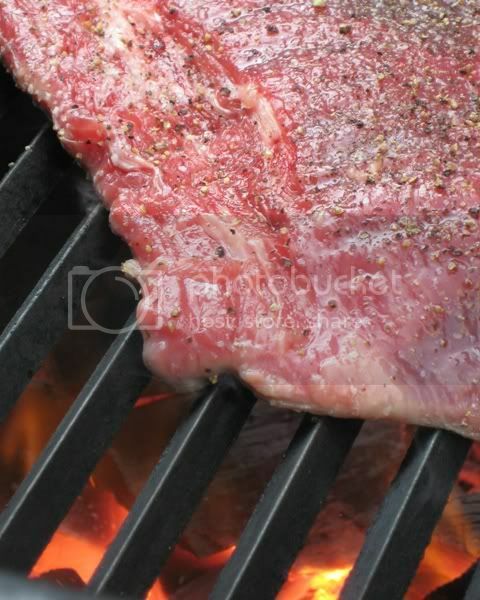 Try basting it on the meat right after the last flip. What are the red specks? So is there any special technique to remove saliva stains off of my computer screen? Mix all the ingredients together with a generous grinding of black pepper. I used white wine vinegar, freeze dried red japs, two green onions in place of the spring onion, some lemon juice and a couple whole bay leaves (remove after a day or two). Make a day or two ahead. Refrigerate. Can be used cold, my favourite way to use it so far is to put it on steaks while being grilled, immediately after the flip so it gets warmed up some. Dried oregano is ok to sub, but fresh is nice. Don't think I would try it with dried parsley. I remember making pesto with dried parsley one time and it was just nasty. The proportions can vary a lot, use a little more vinegar/lemon juice for a marinade for example. I usually use more garlic than called for, make it to your own taste. Thanks R~B this was good!